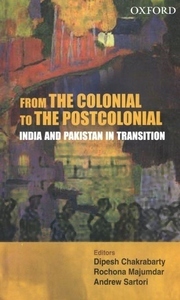 This volume addresses some of the key issues marking the process of decolonization in India and Pakistan. It looks at decolonization as a long-term process and highlights some of the historical complications involved in nations born under the aegis of the colonial rule evolving into postcolonial polities. It concentrates on particular aspects of the social and political processes involved in the transition from the colonial order to postcolonial regimes. The contributors include a range of distinguished scholars from North America, the United Kingdom, South Asia, and Australia. They approach the issue of decolonization in different but mutually reinforcing ways, through constitutionalism, sports, regionalisms, housing, gender, minority issues, mass-politics, and class formation, The contributors include Dipesh Chakrabarty, David Washbrook, Barbara Metcalf, Ian Copland, Gynaesh Kudaisya, and Anumpama Rao.